Earlier this week California Governor Jerry Brown signed into law a contentious, but scientifically supported, bill enforcing strict school vaccination requirements!!! Following the signing, Jim Carrrey went on a rant on twitter raging against the bill. Carrey can claim that he isn’t anti-vaccine, but he is still clearly misinformed when it comes to vaccines and science. Lastly, Carrey included a picture in one of his anti-‘toxin’ tweets (below, the picture has been removed by twitter). Turns out that the boy actually suffers from the disease Tuberous sclerosis, which has nothing to do with vaccines, but IS associated with autism. The boys mother couldn’t be more annoyed that her son’s image was misused by Carrey in such a way. Alex’s photo was removed from Carrey’s tweet on Wednesday night after Echols filed a copyright complaint to Twitter. (Echols’ first-ever tweet was to Carrey asking him to take the picture down.) The tweet had already been retweeted nearly 600 times. Echols first found out about Carrey’s tweet when her brother-in-law posted it to her Facebook wall.​ Her sister, Elizabeth Welch, is also upset about Carrey using the photo out of context. “It kind of felt like he was mocking [Alex], and that’s what was upsetting,” Welch told BuzzFeed News. Apparently the hilarious, but scientifically misinformed, actor hasn’t learned the vaccines-cause-autism-etc-lesson from ex-wife Jenny McCarthy. Yikes! Can your birth month predict disease risk? – Interesting new computational study!! – and VIDEO! Columbia University scientists have developed a computational method to investigate the relationship between birth month and disease risk. The researchers used this algorithm to examine New York City medical databases and found 55 diseases that correlated with the season of birth. Overall, the study indicated people born in May had the lowest disease risk, and those born in October the highest. But developing treatments or prevention approaches for Alzheimer’s disease is difficult. There is no biomarker (for example a blood test) or definitive medical test for it and there is no set age where people develop memory impairments and dementia. Indeed, people can develop Alzheimer’s disease as young as 30 or well into old age. This is a real challenge for diagnosing Alzheimer’s in its early stages. But in people with Down syndrome there is an age-dependent progression of changes associated with Alzheimer’s disease. This makes it much easier to map when and what kinds of changes happen in the brain in the early stages of the disease. If we can understand how and when changes in the brain start to happen in people with Down syndrome, that could help us find ways to slow or prevent Alzheimer’s disease in this vulnerable group and for others with Alzheimer’s. The lifespan of people with Down syndrome has dramatically improved from 25 years in 1983 to over 60 years today although some minority groups still have lower lifespans. Although many people with Down syndrome remain healthy as they get older, most are vulnerable to the development of Alzheimer’s disease. Virtually all people with Down syndrome over 40 years old develop Alzheimer’s disease. It is estimated that over 70% in their 60’s and older also have dementia. This is a much higher rate than people without Down syndrome. Over 95% of people with Down syndrome have a full extra copy of chromosome 21. There are two other causes of Down syndrome that include partial trisomy 21 where only a piece of chromosome 21 and associated genes are triplicated. The third type of Down syndrome is called mosaicism, where not all of the cells in the body have a fully extra copy of chromosome 21. 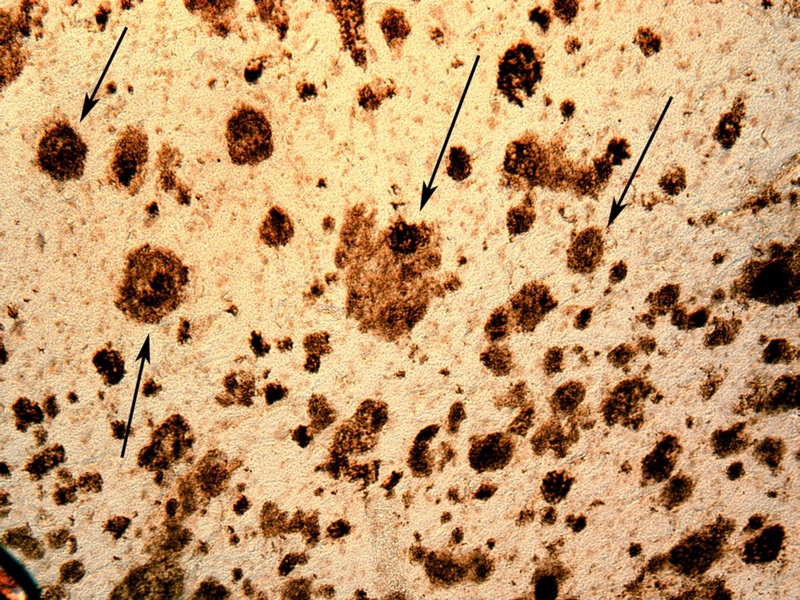 The gene for amyloid precursor protein, which is thought to be important for Alzheimer’s disease, is located on chromosome 21. 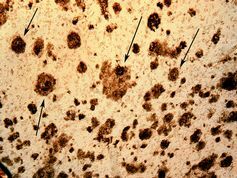 This amyloid precursor protein is cut into smaller pieces and the smaller protein, called beta-amyloid, is toxic to the cells in our brain or neurons. 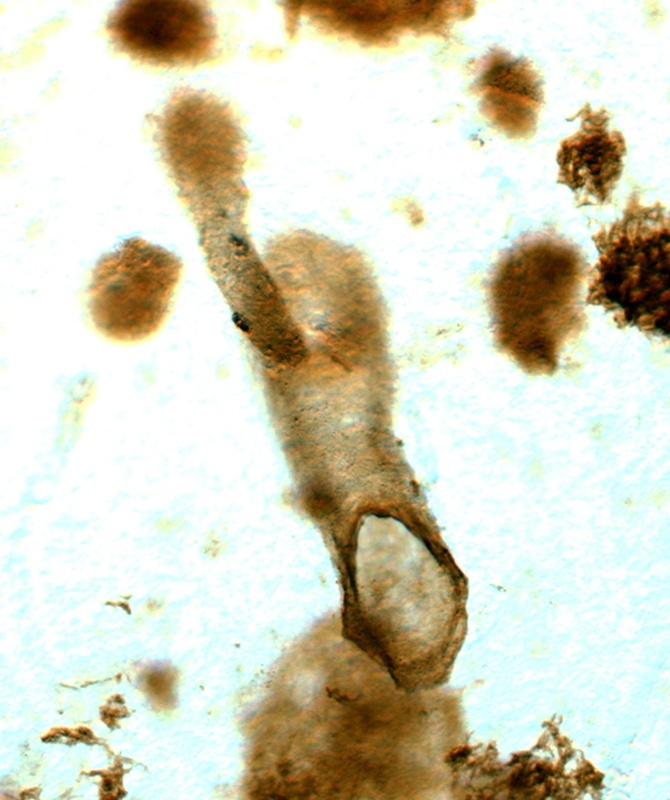 It collects into structures called beta-amyloid plaques, which are a hallmark of Alzheimer’s in all people. The plaques make it hard for neurons to communicate. In people without Down syndrome there are normally two copies of this gene. In people with Down syndrome there are three copies of the gene because of the extra copy of chromosome 21. That means from an early age people with Down syndrome are making more of the beta-amyloid protein. Beta-amyloid plaques are consistently observed in the brains of those with Down syndrome in their 30s, but they have also been reported in people eight- to 15 years old. How does the brain change in people with Down syndrome as they get older? 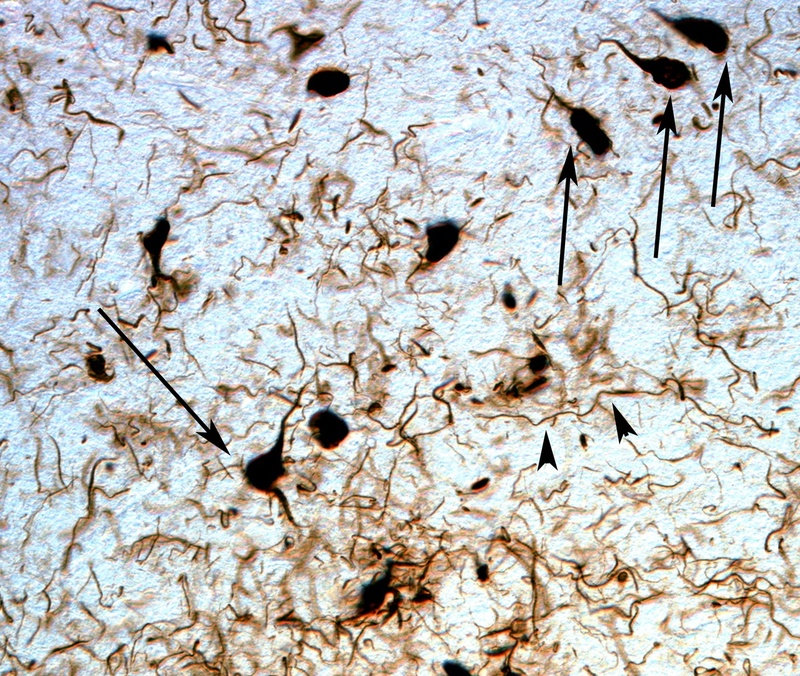 The second feature of Alzheimer’s disease is neurofibrillary tangles. 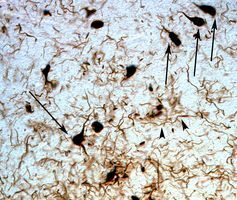 These are made up of a protein called tau that builds up inside of neurons in the brain and prevents them from functioning properly. For people without Down syndrome, these neurofibrillary tangles can start to develop anywhere from age 30 to over 100 years. But for people with Down syndrome these tangles do not start to accumulate until they are over 40 years old. This is another example of how it may be easier to understand Alzheimer’s disease in people with Down syndrome because we know the ages at which neurofibrillary tangles begin. Other changes that are common in Alzheimer’s disease also happen with age in Down syndrome including increasing brain inflammation, oxidative damage and loss of proteins in synapses, which are the connections between nerve cells of the brain. All of these features may lead to impaired brain function. When we learn more about when these changes happen, we can also start to think about ways to prevent or reverse them. What does dementia look like in people with Down syndrome? Many people are aware of the early warning signs of Alzheimer’s disease and that the loss of short-term memory is one of the key features. For people with Down syndrome the evidence suggests similar changes may also happen in cognition and behavior as in the development of Alzheimer’s disease. Memory and thinking changes also appear in dementia with Down syndrome, but are more difficult to observe because of the nature of the intellectual disability. But other changes, like social withdrawal, mood changes (including anxiety and depression), aggressive behavior, lack of interest in usual activities, change in sleep pattern and irritability, are easier to detect in Down syndrome. Similar changes also happen in people without Down syndrome who develop dementia in the moderate to severe stages of the disease. What changes can we see in the brain by imaging? The brains of people with Down syndrome have some differences compared to people of a similar age without Down syndrome. For example, in people in their 40s, the hippocampus of someone with Down syndrome may already show signs of atrophy (getting smaller) signaling early Alzheimer’s disease, a change we do not usually see in people without Down syndrome. Our research group has been studying the connections between different brain structures by measuring white matter integrity – which is how well the long axons, the threadlike parts of neurons that connect to other neurons, are functioning. We do this by measuring how water molecules move along axons in people with Down syndrome. We have found that the frontal lobes in people with Down syndrome may become increasingly disconnected from other parts of the brain. Similar changes in the white matter connections happen in Alzheimer’s disease in general. In our study we see these changes in people in their late 30s, when we typically do not see these changes at all in people without Down syndrome. If we can understand the predictive value of these images then we can determine what age is best to intervene and prevent the development of Alzheimer’s disease not only in Down syndrome but also in the general population. Some older adults with Down syndrome never develop dementia despite a genetic vulnerability to the disease. Because of this, we may get some fascinating new leads on ways to promote healthy brain aging in people with Down syndrome that may also be translated to the larger population. Following people with Down syndrome as they age will provide exciting new approaches to promote brain health in this vulnerable group of individuals. To facilitate aging studies in Down syndrome, the National Institutes of Child Health and Development has taken the initiative to launch a Down Syndrome Registry that will help connect families with researchers and resources – and hopefully benefit people with Down syndrome by identifying ways to enrich their development and reduce risk of disease. Elizabeth Head is Associate Professor at University of Kentucky.